Visit often, outdoor gear and apparel will be added throughout the year. Bucking Bronco Hat - Very Popular "Cowboy Tough" version. Click hat for full description. The Bucking Bronco Hat is an officially licensed hat of the University of Wyoming. The hat is Faux leather, distressed brown crown and bill with leather patch sewn on. Tan mesh with matching tan snap-back. A $5 donation will be made to the University of Wyoming Club Baseball Team for each hat sold. Thank you for your support. compared to a normal travel mug and is BPA and lead free. Not recommended for dishwashers, hand wash only. Monogram Your Mug, send us the First Name and Last Name initial for each Mug. Steamboat w/ State Seal 20 oz Rambler - Custom powder coated candy red and candy blue. The engraving is the world famous Steamboat with the Wyoming State Seal, revealed in the engraving. This is a one of a kind product for that special someone. This product is officially licensed with the University of Wyoming. Available in stainless and DuraCoat™ colors. Stainless Steel Vacuum Insulated Tumbler. Select Silver (the first color in the list) for Red, Silver and Blue Steamboat Rambler. As Pictured. Place cursor on color to see color name. Slider Lid included with each order. University of Wyoming Steamboat 20 oz Rambler - Powder coated brown and gold with the engraving of the world famous Steamboat bucking bronco onto a Polar Camel Rambler. This product is officially licensed with the University of Wyoming. Place cursor on color for color name. Click on color to open quantity box. Click on the first color in list (Brown and Gold for the 2 tone cup pictured). 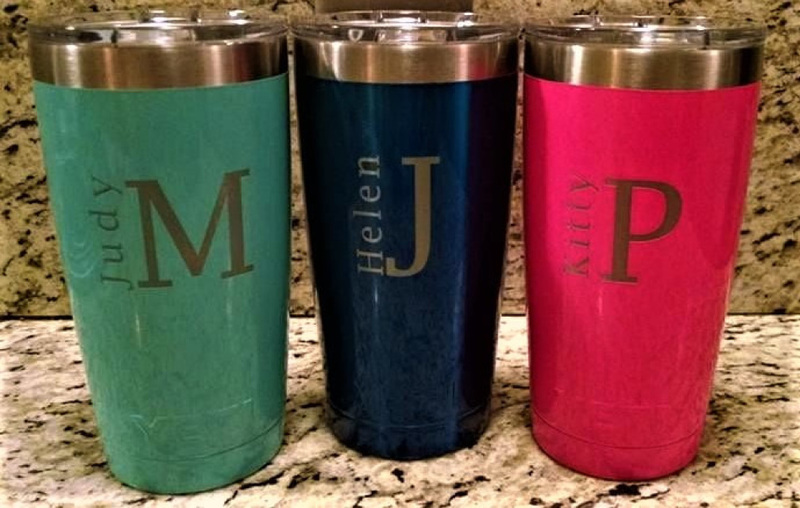 For Custom Orders, Submit Artwork, Fonts or Names for Block Monogramming your Cup. WORDING OR FIRST NAME AND FIRST INITIAL OF LAST NAME. Design your cup, pick a color, submit the wording, or submit first name and last name initial. Available in stainless and DuraCoat™ colors. Stainless Steel Vacuum Insulated Tumbler. Place cursor on color for color name.